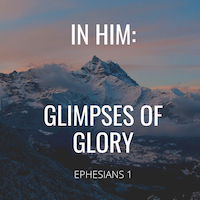 This is the third in a three-part series based on Ephesians 1:3-14, entitled “In Him: Glimpses of Glory”. So far in this series we’ve seen that in Christ is found true meaning in life (Eph 1:4-5) and true freedom in life (Eph 1:7-8). This time, we’ll see in Ephesians 1:11-12 Paul pointing us toward finding our true purpose in Christ. From a Christian worldview, we believe that the Gospel provides rational, logical, moral and practical answers to the big questions of life. In Ephesians 1, Paul repeats three times that we are purposed according to God’s will (v5, v9, v11). According to Paul, life is a gift from God (v4). And it’s a gift given for a purpose: to live for His glory (v12), and to make much of Him. All of us spend our lives. Our lives get used up. Our days are numbered. The question for all of us is: What will we spend our lives on? The Bible says we have only two options: either we will spend our lives living for our own glory, or living for the glory of God. Jesus is not a “divine lifehack”, allowing us to live a fuller and more meaningful version of our existing life. Jesus didn't come that we might live more effectively as the centre of our own existence. Jesus came that we might discover what the true centre of our existence actually is, and in doing so, find true purpose in life. Some people object to the idea that God demands to be the centre of our lives, and that this reveals him to be an egomaniac, a control freak, or both. Rather, the exact opposite is true. In demanding our praise, He is demanding the completion and fulfilment of our joy, satisfaction and pleasure. God’s invitation to pursue His glory turns out to be his greatest act of love, since in the pursuit of God’s glory we find true purpose and true joy and fulfilment. Work is good because it is a gift given from God. Work is not man’s idea but God’s. He has put us in motion. God intends that work should be motivated by a sense of purposefulness in life. We are not just serving the system. Work was never intended only as a means to an end. Work is good because we are made in the image of a working God, a God who derives great pleasure and satisfaction from His work (see Genesis 1). The Bible describes the work of our hands and our worship as being inseparable. The Hebrew word abad is at various times translated throughout the Bible as ‘serve’, ‘work’, ‘labour’ and ‘worship’. For example, God put Adam to work in the Garden of Eden so that he could worship by the work of his hands (Gen 2:15). In this context, we see that work and worship are intertwined. We find true purpose when our work becomes worship, and our worship finds its fullest expression in our work. In Revelation 4:10 we see a similar picture as the twenty-four elders (representing the church) throw their crowns (achievements, accomplishments or rewards of work) before the throne of God. Here we have a vivid picture of work being offered as worship. While cleaning out our garage recently, I came across boxes full of my old sporting trophies. After trying (unsuccessfully) to convince my girls that these trophies and medals represented the vast sum of their father’s sporting prowess and accomplishments (“Yes”, they agreed, “they’re quite pretty”! ), the trophies were packed up, the medals collected, put in a bin and sent to adorn the piles of human waste at the garbage dump. All our crowning achievements in life, if stored up for ourselves, will eventually end up on the rubbish pile of history. But when those same crowns are offered as an act of worship, they become an eternity of adoration of the One who is worthy. All of us are either collecting trophies for the trash or crowns for an eternity of worship. And so, it seems it’s impossible to be human and not seek meaning, freedom and purpose in life. Ephesians 1 shows us that true meaning, freedom and purpose is found in Jesus Christ. We are not here only to fill our bellies, trying to fill the emptiness while we find some way to amuse ourselves until we die. We are worshiping Christ. When Christ is our greatest passion, all aspects of our lives - even the mundane, and even the hardships - are infused with great meaning and purpose. In Him, we find absolute, certain, complete and satisfying meaning. In Him, we find freedom in submission to His truth. In Him, we find purpose as we offer the work of our hands as worship. Newer PostIs Jesus Your Something, or Your Everything?